The PROBLEM is DEATH. We need to SOLVE that. Autonomous Vehicles would SOLVE that. Here's why. There are 3 Main Reasons why there is DEATH on our Roadways. 2) DISTRACTED driving in all of its forms, 3,285 fatalities per year in US by a DISTRACTED driver. 3) DRUNKEN-driving, 10,874 fatalities per year in US by an IMPAIRED driver. 11) lack of consideration for safety. 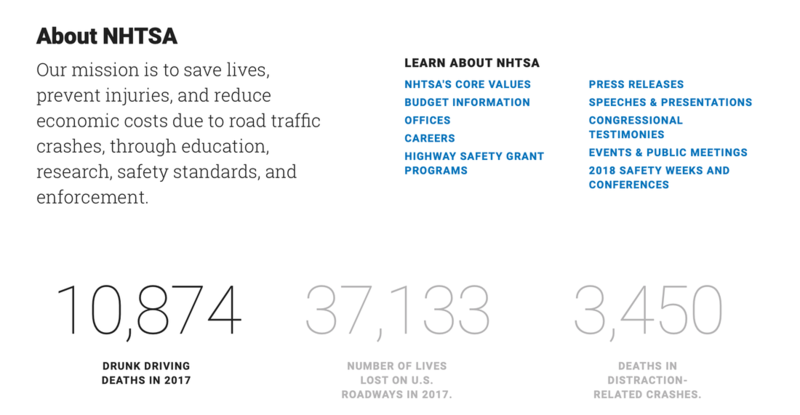 All of these safety diminishing human factors can be completely removed with an advent of autonomous vehicles becoming ubiquitous throughout our transportation systems throughout the world. Think of it, no more people killed by drunken drivers, no more foolish mistakes taking place on the roadways causing death, no more reckless driving, no more road rage, pedestrians and bicycles completely safe because they are seen, and because we have reinvented our transportation system. Autonomous Vehicles will ELIMINATE every. single. one. of these 3 fatal human elements, which comprise 100% of fatal accidents. This is it! !